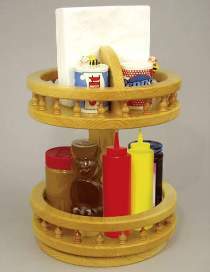 Simply rotate this Tabletop Tower to have napkins and all kinds of condiments at your fingertips. Make from 3/4" lumber. All patterns drawn FULL SIZE. Measures approximately 15" high by 11" in diameter. Order #W3584 Tabletop Tower Plan, 40 each #S1 Galley Spindles and #LC6 Lazy Susan Bearing separately or save by ordering the #5067 Tabletop Tower Special. The #5067 Special includes #W3584 Tabletop Tower Plan, 40 each #S1 Galley Spindles and one each #LC6 Lazy Susan Bearing.